Have you ever had that special game? The game that will forever live in the memory bank, the game that is talked about for the next ten years, and with little fuss, descends into legend and club folklore. The game that unites an entire group of people together for a lifetime, bound by one common feature – they were all involved that day. Perhaps it wasn’t a single game; perhaps it was a season, or a campaign or a cup run. Regardless of the specifics the feelings, emotions and euphoria associated with such an experience evade most sportspeople for a lifetime; it’s what we play or coach sport for – to find that ever elusive victory within (yes Coach Carter was on my film list over the Christmas period! ), and to inspire ourselves and the people around us. Watching BBC’s Sports Personality of the Year over the festive period left a very poignant message about the importance of team players; in particular during the speech of Rugby League star Kevin Sinfield. Limited would be an exaggeration to describe my knowledge of Rugby League at the best of times but Sinfield, who has played for Leeds Rhinos and England for almost 20 years, amassing over 4000 career points was quick to attribute his success to others. He spoke of how his whole team should be up on the stage with him, collecting 2nd place, as without them he would not have become half the player he was. If I said to you now to name the ‘ultimate team player’ in your current environment no doubt you would have someone in mind. This is the player that sacrifices anything and everything for the good of the team, without question and without complaint, never once putting his/her needs above others. Now ask yourself – is this player one of your key players? Whether you directly associate ‘key player’ with performance is an interesting question, but all too often in sport (perhaps more so at club level), these players are cast aside and not recognised or rewarded for their endeavours. Ironically team success would be much harder to achieve without them, though to an onlooker it might not look like they have contributed on a performance level. It might be that one person that trains tirelessly every week but is always on the substitute’s bench, or that person that constantly finds themselves batting at number nine without bowling every Saturday. After all, it is skill that often wins you matches, despite it being the hardest facet of any sport to master, but the easiest thing to measure someone against. And, ultimately, not everyone can be that star performer. Let me explain an example to you of why performance alone is not an accurate enough measure of someone’s value to a team. There was once a bloke who was the lifeblood of his club – from the age of 8 everything from the way he conducted himself on and off the pitch, to his relationship with members and team mates epitomised the values and traditions of the club. For the last 7 years he has been club and team captain. In keeping the identity of this person anonymous let’s call him Justin. Whilst having played to a good level himself, Justin it is fair to say, has not performed anywhere near the standards that he is capable of – I am sure he would agree. His performances in a lot of other clubs might have meant that he would have been dropped after 4 games – with selectors labelling poor form, repetitive mistakes and inconsistency as justifiable reasons. BUT…..
What the statistics don’t tell you is that Justin brought so much more to the game than merely performance. He was the ‘ultimate team player’ – every single player wanted to play for him. He developed an environment where the players fought for each other as hard as they possibly could; where they were allowed to express themselves and their individual ways that facilitated outstanding performance. Nobody questioned Justin’s performances. There was no need to – everyone recognised that Justin’s job was to make sure that the other guys around him were able to perform. If he was able to contribute too that was a bonus, but if he didn’t it just didn’t matter. It goes without saying that whilst each of the seven years Justin has led his team have been memorable, the players involved have experienced that season; that special season that will never be forgotten – twice. With money constantly dictating sport at the highest level, the pursuit for the very best performers is a constant battle for managers and coaches. They are sought after so much because they possess the skills needed to win…..but what about those players, like Justin, that do not have performance as evidence of their importance to a team? What happens to them? Most likely they are cast aside, deemed not good enough because they do not have what it takes. Oh but they do. Maybe they don’t have the skills, but they have a deeper ability to influence others. An ability that makes them one of the most coveted prized assets to any team. It is ingrained in their attitude, their commitment, their desire and their personality. Ask yourself what’s more important? An individual’s performance or their underlying traits? Those of you that are following Leicester City’s remarkable season thus far cannot deny that their collective spirit and attitude is contributing to their success. Their squad value has risen from £41M to £166 in the space of a year. There is no chance that they have become world class in the space of a year! No, something deeper is at work – they have an unshakable togetherness and belief that they can be successful. 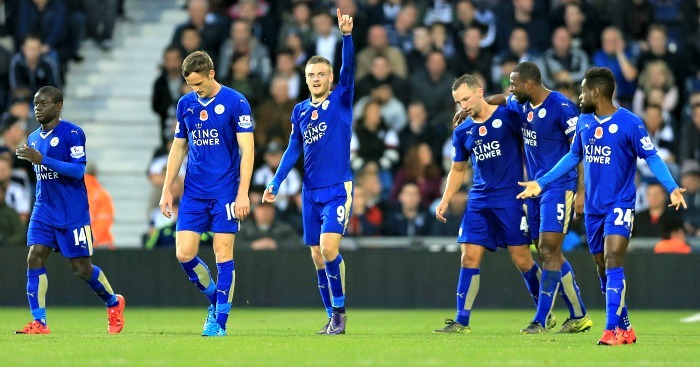 Everyone contributes to that, from Jamie Vardy who is now worth £18.8M to Robert Huth who is valued at around £200K. I suppose the message is let’s not dismiss those ‘team players’ as incapable. Let’s not define success solely in terms of performance; let’s not deprive players like Justin the opportunity to go and make a difference at a higher level. Not only might they bring you just as much success as a star performer, they’re guaranteed to be cheaper! Leicester City’s Jamie Vardy (centre) celebrates scoring his side’s third goal of the game during the Barclays Premier League match at The Hawthorns, West Bromwich. PRESS ASSOCIATION Photo. Picture date: Saturday October 31, 2015.